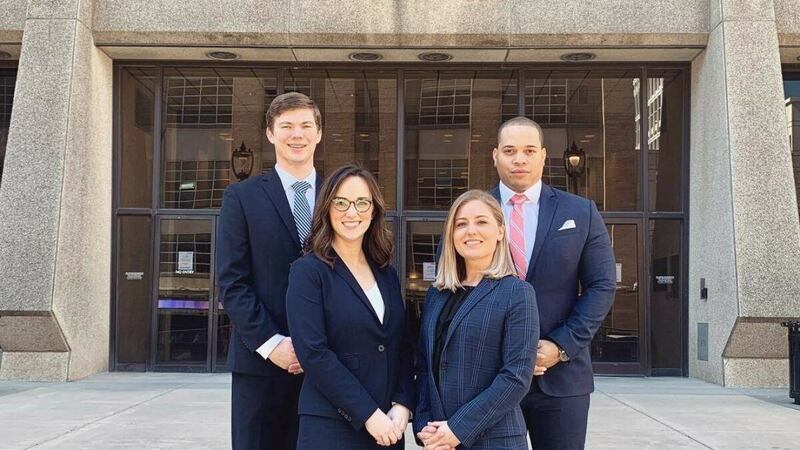 RALEIGH — Campbell Law is sending a team of its top student advocates to compete at the American Association of Justice (AAJ) Student Trial Advocacy National Competition on April 11 – 14 in Philadelphia, Pennsylvania. The team of second-year students Lydia Stoney, Kevin Littlejohn, and Ethan Carpenter and third-year student Anna Claire Turpin beat out a talented team from Wake Forest School of Law to win the regional competition held in downtown Raleigh in early March. The team is coached by Jacob Morse, a 2017 Campbell Law graduate and associate attorney at Wyrick Robbins. This is the third time Campbell Law has competed at the AAJ national competition since 2011. The AAJ Mock Trial competition seeks to inspire excellence in trial advocacy through training and education for both law students and practicing attorneys. The association accomplishes this goal in part by sponsoring the Student Trial Advocacy Competition, an annual nationwide mock trial competition. The competition is an exceptional opportunity for law students to develop and practice their trial advocacy skills before distinguished members of the bar and bench. Campbell Law Dean J. Rich Leonard said Marcari, Russotto, Spencer and Balaban have agreed to once again sponsor the winning AAJ team of student advocates. The firm’s gift will provide financial assistance for the students’ preparation, travel, and lodging as they compete for the national championship. Don Marcari is a 1985 graduate of Campbell Law and senior managing partner at his firm, Marcari, Russotto, Spencer and Balaban. He first gained national attention when his exploits as a young defense attorney with the U.S. Navy Judge Advocate General’s (JAG) Corps became the basis for the motion picture “A Few Good Men.” He has been fighting for seriously injured people throughout North Carolina since 1985, and Virginia since 1988, concentrating on plaintiff personal injury law and civil litigation. In addition, he handles veteran benefits claims and continues to defend select members of our military service in courts martial and administrative proceedings.